An electrical engineer, Bush invented in 1931 the Differential Analyzer, an advanced electromechanical computer. When World War II began in Europe in 1939, Bush persuaded President Franklin D. Roosevelt to create the National Defense Research Committee (with Bush as chair) to organize defense-related scientific research. Bush next chaired the even more powerful Office of Scientific Research and Development, which oversaw development of radar and the atomic bomb, among many other warrelated technologies. 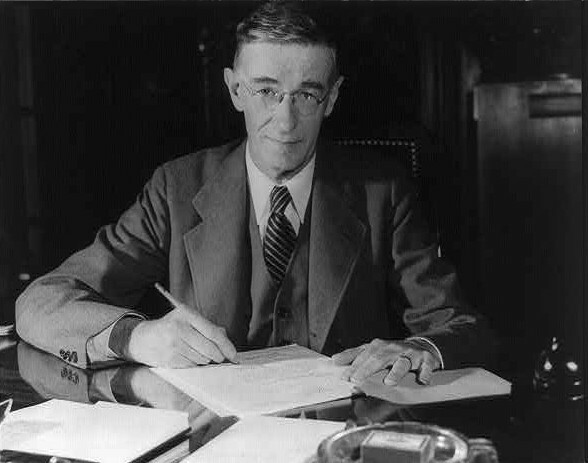 Vannevar Bush was arguably the most powerful scientist of his time.